We are fortunate to live in Seattle, Washington. It’s close to the ocean, mountains, countryside and several other metropolitan areas. 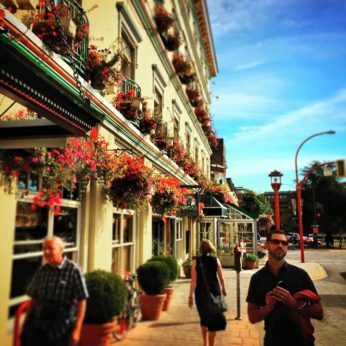 One of our favorite cities to visit locally is Victoria BC. The city touts itself as being more British than Britain. I can’t agree for certain, but it does a fine job of trying. Between the outdoors and the great dining, it’s the perfect destination for couples (and families too, but that’s a different itinerary). A getaway to Victoria BC is great in any season. If you’re visiting either Seattle or Vancouver, Victoria BC is well worth at least one day out of your trip. Here’s why: Beer. No, I’ll save that. Flowers. No, I’ll save that too. Basically, you’ll see that there are so many ways to relax in Victoria. Someday we’ll share details about the rest of Vancouver Island, but for now, here’s our ideal plan for a couples getaway to Victoria BC. From Seattle, you’ve got several options for how to get to Victoria BC. From the general Puget Sound area, you’ve got even more choices! Depending on your budget and how much time you want to spend in Victoria, choose the option that’s best for you. 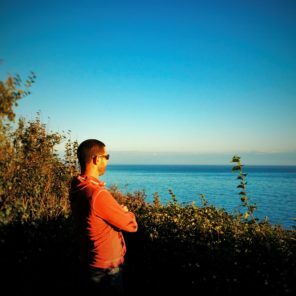 There are three options for getting to Victoria BC from Seattle. The first is to just fly from SeaTac International Airport (SEA) directly into Victoria International Airport (YYJ). It’s a short flight and usually is available a few times each day via Alaska Airlines. Other major Canadian airlines also fly into Victoria from around Canada. 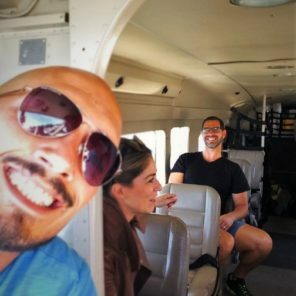 For a more exciting flight to Victoria, you can travel via seaplane. 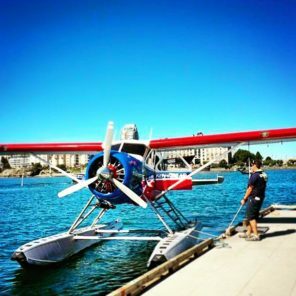 What is better for a getaway to Victoria BC than arriving via seaplane? Kenmore Air flies from Seattle’s Lake Union air harbor to Victoria’s Inner Harbor. Customs is done on the dock and then you’re there, downtown and ready to explore. 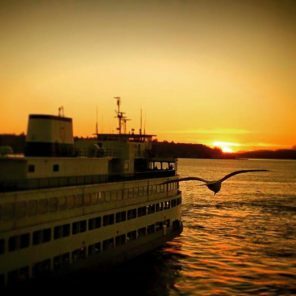 The last option for transportation from Seattle to Victoria is via the Victoria Clipper. The two hour boat trip from downtown Seattle is a fun way to relax on the way to Vancouver Island. On a windy, rough day, the ride can make you a bit nauseous if you’re susceptible to that, but any other day it’s a great adventure and is for sure one of the classiest modes of transportation in the Pacific Northwest. 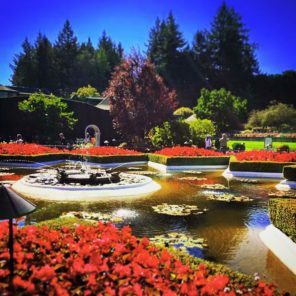 From the Puget Sound area, you have two more ways to start your getaway to Victoria BC. Both are via car ferry, but two different departure ports. From Anacortes, you can take the Washington State Ferries to Sidney, BC. The sailing leaves in the morning (off season, multiple sailings may be available in high season) and takes nearly three hours to get there. It stops at several of the San Juan Islands, but you need to stay with the ferry to not get stuck on an island, as not every boat that comes to each island ends in Sydney, BC. Reservations suggested. The other ferry from the Puget Sound area goes from Port Angeles on the Olympic Peninsula. The MV Coho is a drive-on or walk on boat that crosses the Strait of Juan de Fuca. You could start your whole getaway to Victoria BC with a mini-getaway to the Olympic Peninsula (love our favorite B&B, Domaine Madeleine), or just drive to PA and park in the structure across from the ferry terminal. It’s your choice. Reservations strongly suggested, nearly required. The last option for getting over to Victoria is from mainland Canada via the Tsawwassen Ferry. This ferry leaves from just south of Vancouver, BC eight or more times each day. With such frequent sailings, going this route makes a getaway to Victoria BC easy to add to a Vancouver trip. And since the ferry gets you to the greater Victoria area (northern Sidney), it’s a great way to actually tackle other things to do around Vancouver Island, not just in Victoria BC. Being both historic and quite cosmopolitan, Victoria has some very diverse activities to enjoy. You can just stroll around downtown drinking tea or you can go full adventure and get out on the water. 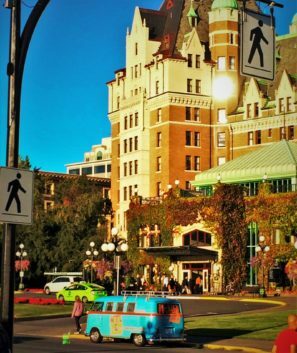 Our plan for a great getaway to Victoria BC can be adjusted for the weather or your interests, so have fun with it! 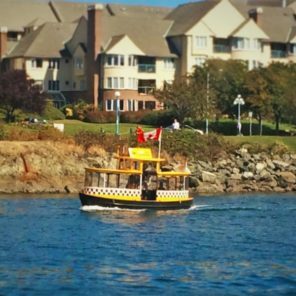 Once in Victoria there are water taxis that if they had cheeks, you’d want to pinch them, they are so cute. 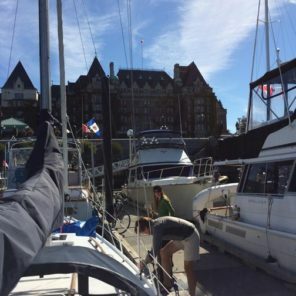 There are other boat options for getting to other parts of the island too, especially if you’re venturing beyond the main harbour area on your getaway to Victoria BC, but those are primarily their own travel style and warrant a dedicated trip of their own. There is a bus system in Victoria that’s pretty comprehensive. Whether you’re hanging out downtown or want to check out Sidney or Sooke, the transit system can get you anywhere. We recommend the Day Pass for BC Transit, as it gives you hop on/hop off privileges and is by far the best deal if you’re riding for more than one transit segment. The buses make a trip to Victoria extra affordable and easy. The best transportation in Victoria though is most definitely the bikes. Bicycles can be rented from vendors or borrowed from hotels. The city is very bike friendly and has a vast network of off-street bike paths to get to the major sights. The Galloping Goose Trail, paired with a few others, allowed us to safely bike from our hotel, Hotel Zed, out to the Butchart Gardens and Brentwood Bay. It was really fun and exercise than we planned on getting. Note: if you do head northeast via, you’ll find that there are small car ferries that go between the tiny port towns. Be sure if you head this way that you’ve made a good plan about getting back, as ferry service is limited and you don’t want to end up stuck across a bay some where. Example, the Mill Bay Ferry out of Brentwood Bay. Bike rental tip: there is a bike rental shop directly adjacent to the Inner Harbour, making it easy to start your day with a bike and return it before you catch your boat or plane back to the mainland if you’re just doing a one day getaway to Victoria BC. The Inner Harbour is beautiful. It is small with cute little water taxis bustling about. 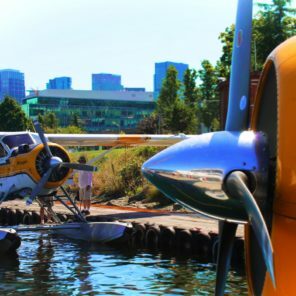 From sailboats to seaplanes, everyone makes port here. The harbour also has stunning architecture surrounding it. Even if you never get off a boat or enter a building, pulling into the harbour is worth it on its own. 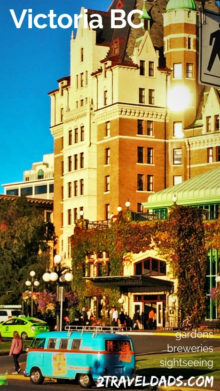 Immediately you are greeted by the Parliament building and the Fairmont Empress Hotel. Both are prime examples of grand Victorian architecture. 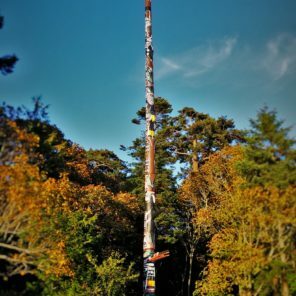 In the immediate area there is also a notable collection of totem poles (integral to the Pacific coast experience). Just off the Inner Harbour you’ll find the Royal BC Museum, and this is the place to go if you really want to see and learn about First Nations peoples and the native art of Canada. We’ve been to Victoria in all four seasons and every time there’s been some sort of festival or event happening around the Inner Harbour. The coolest (har har har) was the street hockey tournaments that took place directly in front of Parliament in the street. Really cool and oh so Canadian. 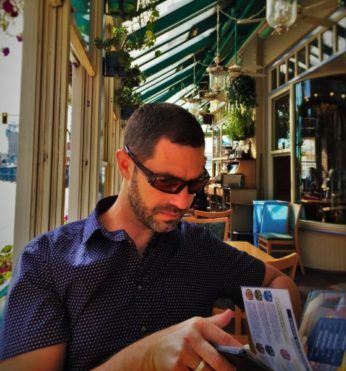 Tip: the Inner Harbour is one of our favorite places to have lunch, especially on a beautiful day. Carve our some time to enjoy watch the boats… and the tourists. Being on the Pacific Coast, Victoria BC joins its sister cities of Vancouver, Seattle and Portland in creating fine beers. 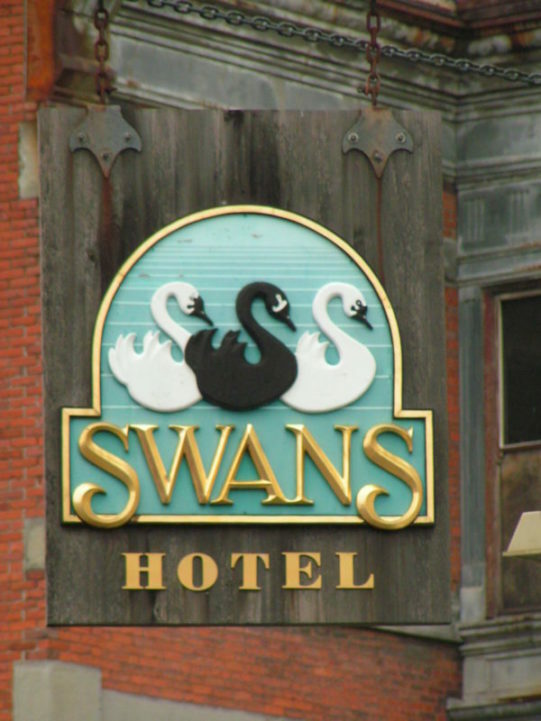 For ease of experience, just head to the Swan Hotel and Brewpub for complex tastes that run the whole beer gambit. There are microbrews from all over at almost every restaurant, but the Swan is our go-to establishment. There are several other options, including Driftwood Brewing and Vancouver Island Brewing, and if you’re leaving downtown Victoria BC even more, and I doubt any would disappoint. As craft brewing continues to grow and we continue to do an annual getaway to Victoria BC, we’ll add more of our favorite breweries from the southern end of the island. Beer lovers tip: seek out a beer shop if you’re really into it. There are several options for purchasing local microbrews in bottles or growlers to go. Check with the shop or customs office by the Inner Harbour to get the details about what can or cannot be taken back into the USA. This is, of course, easiest if you have arrived via sailboat or have friends with a boat, but you can also hire sailboats for a day or a few hours. If you would like to spend a day on the water, this is a great way to do it, weather permitting. 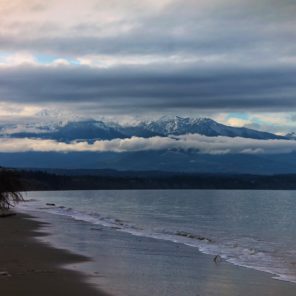 Sights to see when boating around the southern tip of Vancouver Island include the Olympic Mountains across the Straight of Juan de Fuca, east out of the harbour towards the mainland there is a beautiful lighthouse to see, and don’t forget whales! 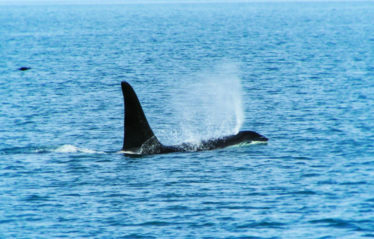 There are resident and transient orca pods that move around Vancouver Island and down into the San Jaun Islands (USA). You can book excursions out of the Inner Harbour if you want to experience something more thrilling (like a jet boat) and some tours guarantee that you’ll see whales, but anyway you roll, your time on the water will be magical and relaxing. Tip: check with the tour companies for whale watching conditions, such a Prince of Whales, prior to planning a day around seeing whales, as the season typically runs from early May to mid October and there are times when the seas aren’t super calm and you may not love the experience. Butchart Gardens and Beacon Hill Park are two of the most amazing collections of botany I’ve ever seen. 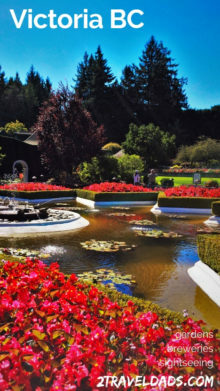 Butchart Gardens is sprawling with blossoms and stunning landscape architecture. The cost per person is a bit up there for a garden ($30+ USD) but the gardens are impressive. And Christmas time the Butchart Gardens are fully done up for the holidays with lights and seasonal foliage. Amazing! **full article coming soon! 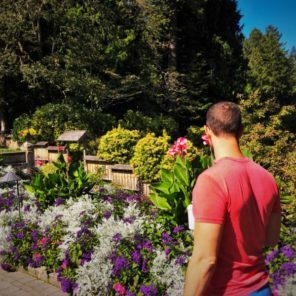 Tip: flowers will bloom until the end of October, so from March until just after the end of summer, you’re good to enjoy them all across the city, but particularly within Butchart Gardens. The micro-climate of southern Vancouver Island is great for flowers! Just up the hill from the Inner Harbour and downtown Victoria is one of our favorite city parks of any we’ve been ever visited. 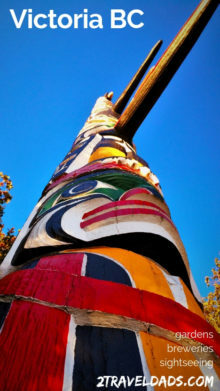 Beacon Hill Park has ornate, antique gardens as well as the tallest totem pole in the world. And the views of the Straight of Juan de Fuca will make you lose yourself when you see the whole of Puget Sound laid out before you. In addition to the Japanese and Victorian gardens in Beacon Hill Park, there are hiking trails and playgrounds. Bravo for a well built city park! 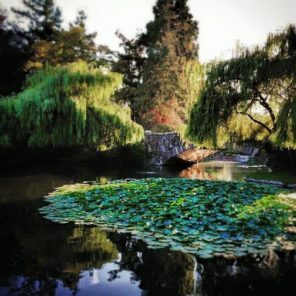 Tip: Beacon Hill park is free to the public, and has several parking areas. The best time to visit the park is before sunset so that you can enjoy the grounds AND catch the sun setting on the Strait of Juan de Fuca. 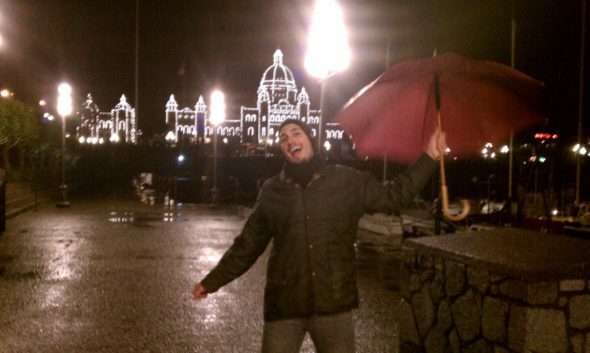 Can you tell that we love doing our annual getaway to Victoria BC? It’s true, which is why we keep on returning. 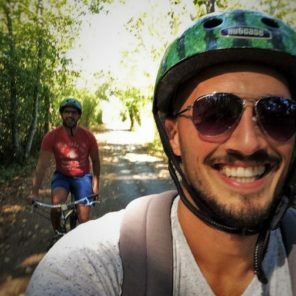 If you do feel like venturing out of the main city, it’s quite easy to get to several smaller towns via bicycle or other means. And if you’re really up for exploring Vancouver Island, head north and spend a week camping or at a remote resort up in Tofino on the Pacific Ocean. Beyond these Victoria BC sights there is much more to do, but this taste is enough to last you a few days. If you’d like to spend time in museums or just relaxing, add an extra day or two. 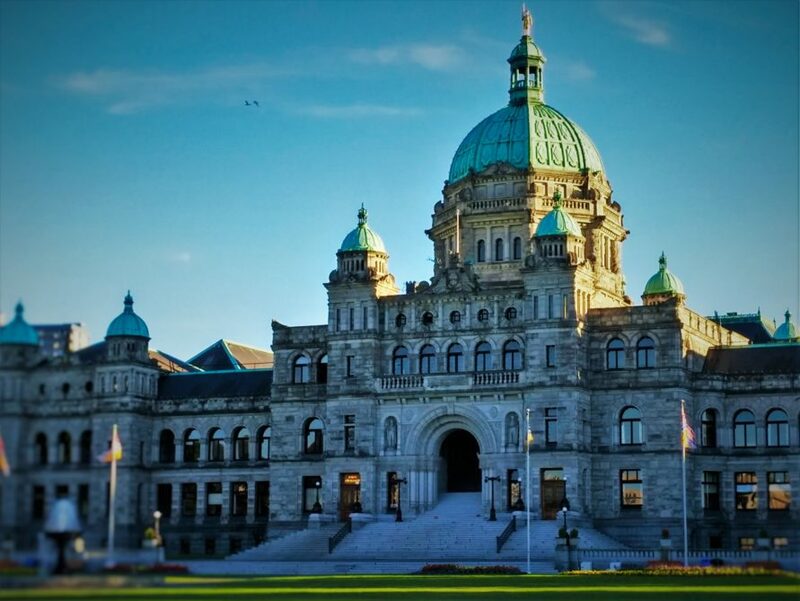 It cannot be stressed enough that Victoria has more sights and surprises than can be captured in a day, but don’t let a short trip length discourage you. Have a great time experiencing the city that’s more British than Britain! 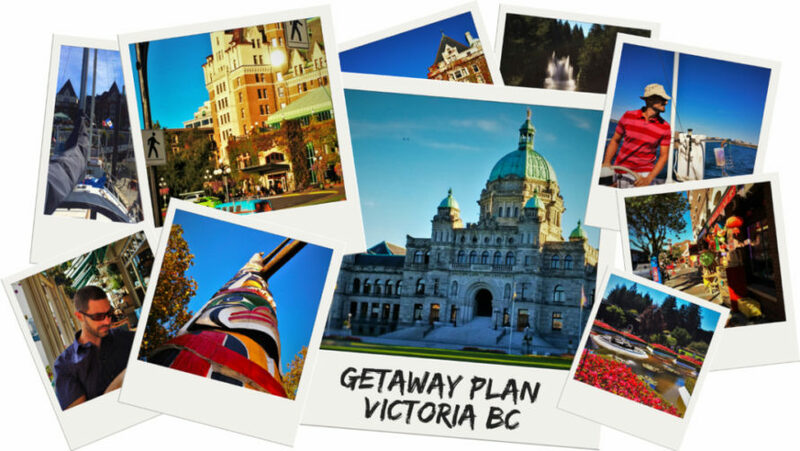 Want to pin this for your own planning for a getaway to Victoria BC? Go for it!!! Love Victoria! I’ve been there a few times, but Al has never been. It’s on our list for places to visit this summer when we are in BC! 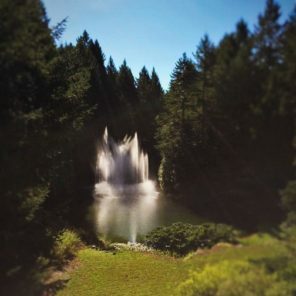 Butchart Gardens is one of my favourite places. 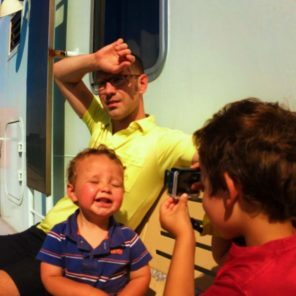 Note to self: Plan a trip to Seattle and stay with “2traveldads”. LOL  I do love Victoria (Vancouver, too). and have had 2 great visits there. Best thing ever: seeing the fiddling Darth Vader in front of the Fairmont Empress Hotel. That was coolness overload! 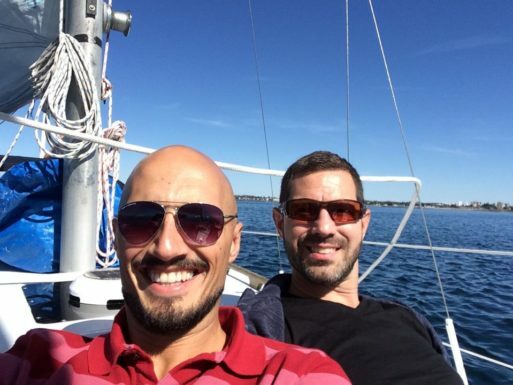 Sailing and spotting those Orcas would be so much fun. Sigh! Some day! 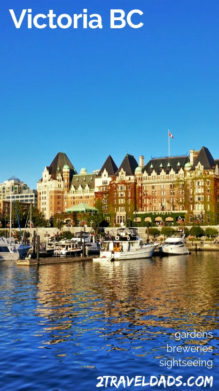 Victoria BC seems like a complete package with something for everyone, no wonder you go there again and again. Nice and informative post. I agree with you about high tea- everyone should try it one. If you ever get to Hong Kong- try high tea at The Pennisula Hotel. Amazing experience.